Police Department in Freehold Township, N.J., Wednesday, Jan. 3, 2007.
sent to the scene said it was not from an aircraft. (AP Photo/ Det. R.
trying to figure out what it was. crashed into the home and embedded itself in a wall Tuesday night. by police. "There's some great interest in what we have here," said Lt.
declined to name the other agencies whose help he said he had enlisted. tiles on a bathroom floor below and then bounced, sticking into a wall. Brightman, who added that no radioactivity was detected. something had crashed through the roof a few hours before. that as to what it might be." planet, said Carlton Pryor, a professor of astronomy at Rutgers University. Pryor, who had not seen the object that struck the Monmouth County home. "These are usually rocky or a mixture of rock and metal." 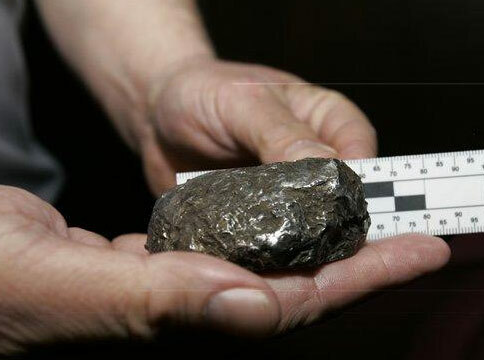 the object were a meteorite. It was not from the neighborhood. found in 1829, in the seaside town of Deal. that they had asked not to be identified. to have caught pieces of molten metal. the core of an asteroid." 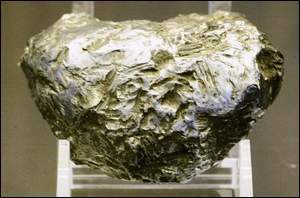 And the scientists are hoping that the owners of the "Freehold Township"
Ahnighito, a 34-ton chunk of the Cape York meteorite found in Greenland. Or, they could sell it. that crashed into a parked Chevrolet in Peekskill, N.Y., in 1992.